Congestive heart failure is a common heart problem in dogs. According to The Dog Health Guide, one in 10 dogs is diagnosed with congestive heart failure each year. Coughing is one of the major signs of congestive heart failure; if you suspect your dog's cough is a sign of this condition, discuss it with your veterinarian so you can begin treatment right away. Congestive heart failure causes weakened heart muscles and prevents the heart from maintaining a normal blood pressure or adequately pumping blood. Many things can cause it, including birth defects, heartworm disease, irregular heart rhythms and heart valve degeneration. 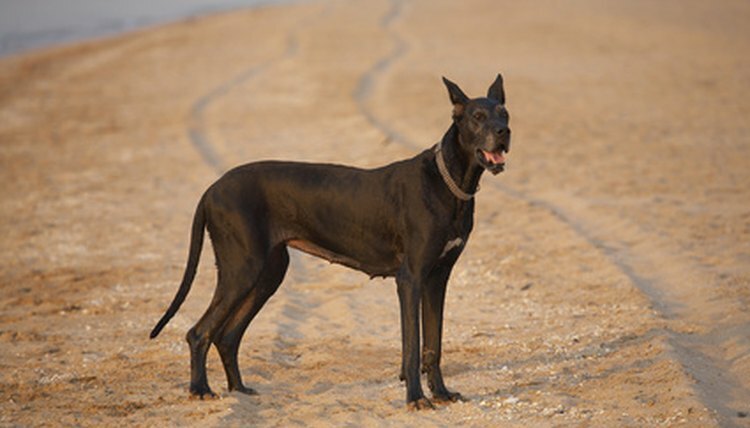 Any dog can develop this condition, but it is most common in giant breed dogs and older, smaller dogs. Coughing is one of the major symptoms of canine congestive heart failure. According to an article published on the Working Dogs website by veterinarian Celeste Clements, insufficient heart valves and the heart enlargement commonly caused by congestive heart failure often cause a productive cough. The dog might cough up watery or foamy fluid as a result. Exercise can make the cough worse and cause other breathing troubles. An enlarged heart can also compress the airways and result in a cough. In addition to coughing and shortness of breath, a dog with congestive heart failure can display other signs of this condition. Symptoms include fatigue, fainting, weight loss and abdominal swelling. As the condition worsens, the dog might have trouble walking or standing up, become unable to exercise, pant excessively and become lethargic. Its gums often turn blue or gray, its heartbeat can become irregular and it may experience seizures. Veterinarians can use X-rays and ultrasounds to detect whether the dog's heart is enlarged or has fluid around it. The vet can also give the dog a thorough examination, listen to its heart with a stethoscope and use an electrocardiogram to determine if the dog has congestive heart failure. No cure exists for congestive heart failure, but many treatment options are available. The vet can administer diuretics to remove fluids from around the heart and in the lungs, and she can drain fluids using a small needle. A low-sodium diet can help prevent fluid retention. Medications can block the hormones that have a negative effect on the heart. Discuss these options with your veterinarian. Working Dogs: Why Does My Dog Cough?